The area of Nevern is not only home to an ancient church and castle but to Ghosts, ancient myths, Arthurian legends, biblical mysteries and bleeding trees! What more could any historian or paranormal investigator want? Nevern is a wonderful spot nestled in woodland and farmland in Northern Pembrokeshire, West Wales. 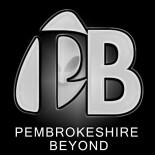 We at Pembrokeshire Beyond and Paranormal Chronicles office often receive reports of a ghostly white-robed man or the sound of children playing late at night at Nevern Church or of terrible blood-curdling screams heard deep within the earth at Nevern castle. Nevern Church. Has a 6th-century robed ghost been seen here? The mysteries of the area are so rich and varied that one with an interest in the paranormal subject could easily dedicate a whole lifetime in pursuit of solving the many mysteries that it presents. Nevern Church is dedicated to St. Brynach, a Welsh Saint, of the 6th century. The architecture was Norman originally and In 1809 a few of the Gothic designs were replaced by modern more contemporary styles. The long nave and chancel may be all of the 15th century. The pier and two arches are Victorian insertions below a wider flatter original arch and the west tower is 16th century. The church has stone carvings which are over a thousand years old, such as the “Braided Cross Stone” with two cords apparently being woven together to make the cross. There is an even older carving, the Maglocunus stone, which throws light on the version of ancient Celtic once used in these parts of Wales, called Ogham. The identity of whom the white-robed ghostly figure is still a mystery, though the witness accounts would perhaps point towards 6th century as the alleged robes seen on the Ghost are of the fashion of the time. Nevern Church, Pembrokeshire. Home to many mysteries and a robed apparition. The bleeding yew at Nevern Church. There are many myths about why the Nevern yew tree bleeds: some say that as Jesus was crucified on a cross it is bleeding in sympathy while others say that it is reflective of the tree of Life in the Garden of Eden. But that wouldn’t explain why this yew tree, in particular, is bleeding. One myth says that a monk was hanged on this tree for a crime of which he was innocent and the tree is protesting his innocence. Some say, more politically, that it won’t stop bleeding until there is a Welsh Prince installed at Nevern or even that it will bleed until world peace is achieved. Nevern Churchyard. Is the alleged sounds of invisible Children heard laughing and talking from people who were buried here? Nevern castle sits today an earthwork with traces of masonry walls and deep rock cut ditches. It overlooks the church of Nevern and its associated churchyard containing early Christian crosses. It lies less than 2 miles west of the present day town of Newport in north Pembrokeshire and was once a center of the cantref and Medieval lordship of Cemais. In the 12th century, the Norman lord Robert FitzMartin and later his son William FitzMartin ruled the barony of Cemais from this castle. The castle was part of a bitter family struggle in the 1190’s after Lord Rhys who had taken the castle from him when he went to fight in the crusade. Initially an earth and timber castle circa 1108-1110; it was rebuilt in stone in the late 12th century. Lord Rhys was imprisoned in 1194 by his sons in this castle, probably in the base of one of the two towers whose remains have been uncovered by recent excavations. The castle was deliberately demolished by 1195 and the site left to agriculture. Visitors whom have visited the castle in evening believe they have heard screams from below their feet. they claim to have heard a man screaming as if in excruciating pain from beneath. The sound quickly ends and a strange chill descends on the site. One couple claims that while on a picnic to the castle they heard sobbing from beneath them and when they put their ear to the ground they heard a terrible anguished howl and then silence. Could this be a victim of the castle dungeon trapped in eternity in his torture or just foxes or badgers deep with the ground in their earthen domains? Other sightings claim to have seen a bearded man wearing a tunic and a strange padded hat “Like a bra cup” The hat description seems more than likely to be that of an arming cap which was a fashionable headpiece during the 12th to 14th Century. Have witnesses seen a man dressed in 12th-century attire at Nevern Castle? On the outskirts of the village and just a short walk uphill from the Castle is a path known as the Pilgrims’ route, and passes a cross – also believed to be at least “pre-Norman” (if not dating from a whole lot earlier) – carved into the rock face of the hillside. One theory has it that the cross is not carved into the rock face, as such, but into the stone of a bricked-up entrance to a cave. What is inside the cave? Well, that’s a matter of some speculation. Some believe that King Arthur himself hid the Holy grail in the cave, while others believe the Knights Templar have placed Christ’s Cross in the hollow behind the rock. Can you make out the image of a cross in the picture below? There is so much to be unearthed at this historic and mysterious location. We implore anyone with an interest in this location to please research further with a great litany of books available and articles written on the area as well as the myths and legends from the time period. One question that we all must ponder. With so much emphasis on such an isolated spot in the world, one has one has to ask why was this spot chosen? We believe the clues and the answers lie behind the mysterious Pilgrims cross and its wall. It was something important enough to warrant a castle stronghold and an ancient church to be built in the area. We will continue to dig deep and follow up soon with any new information on the area. We recommend whichever part of the globe you inhabit that you make a pilgrimage to Nevern…you never know what you will discover. If you have enjoyed this article and a small glimpse into a wonderfully mysterious location then please follow or bookmark this website or follow us on Facebook so you never miss a thing. Thank you and please do sleep well. If you enjoy accounts of the Paranormal then why not read the #1 Bestselling novel and audio book A most haunted house by G. L Davies . A most haunted House is based on a true and terrifying account of a prolific and aggressive haunting in the small Welsh Town of Haverfordwest in West Wales. Seen as controversial and sparking debate between skeptics and believers alike due to the ferocity and intensity of the haunting, A Most Haunted House is the eyewitness account of a young couple fighting to keep their new home and each other as an entity tears their world apart. It’s free to Borrow through Amazon Prime and is also available in paperback and Kindle or listen to on AUDIBLE. This entry was posted on June 14, 2015 by The Paranormal chronicles in Ghosts and Hauntings, Myths and Legends and tagged A most haunted house, Bleeding trees, Churches and castles, Ghosts, Jesus Christ, King Arthur, Nevern.